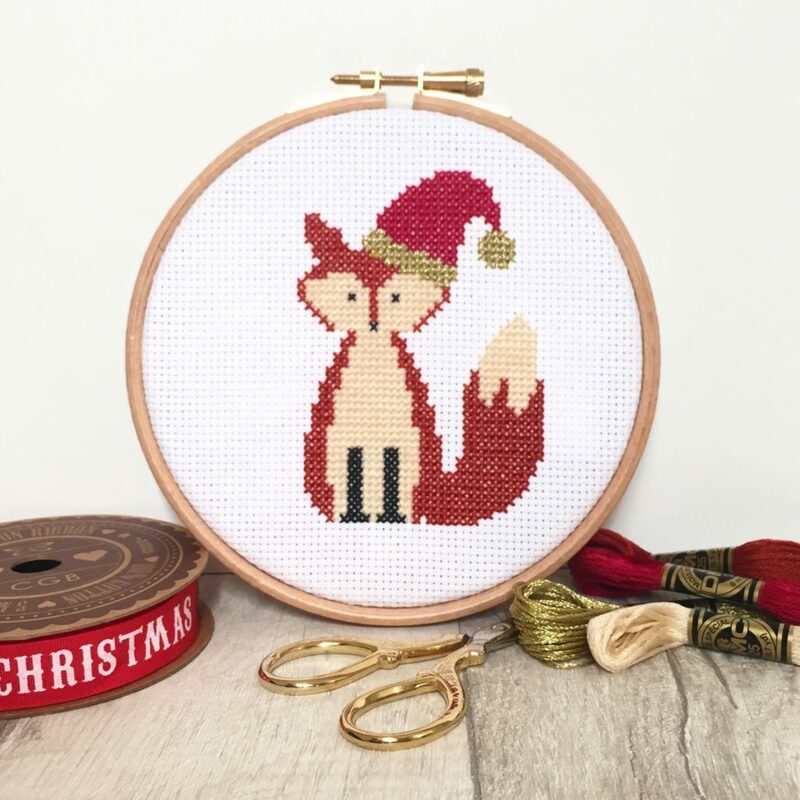 Although the basics of cross stitch are pretty easy to get the hang of, these hints and tips should help make it even easier (yes, it’s possible) and give your finished work a professional look. 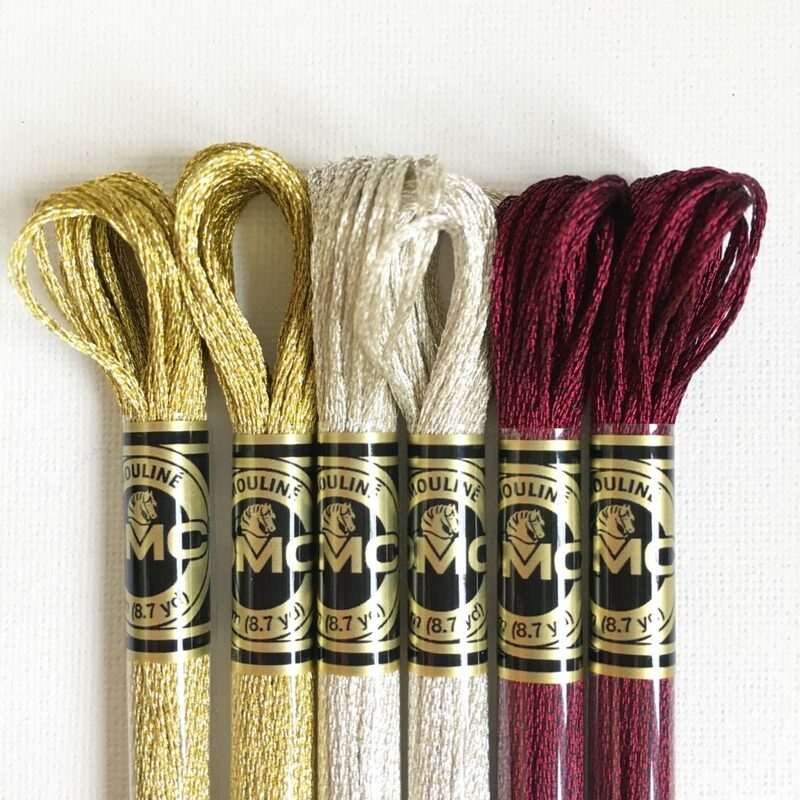 If you have one of my kits your thread will already be pre-cut for you, but if you have a full skein of floss then the usual length of thread used is measuring from the tips of your finger to your elbow. You can also snip all the loops at the bottom of your skein, which should leave you with 24 equal strands of thread. You can pop over to this video to watch how it is done. Some people do find the strands too small using this method, but I personally always cut my thread this way now. When you are making your cross stitches or back stitches, don’t pull your needle too tight when coming back down. This can make your stitches look flat and ruin the aida underneath. Snip the loose thread at the back as you go to stop them getting caught in your new stitches and have a little pot handy to put them in. If you save them all there are some pretty cool things you can make with them on Pinterest such as a phone case and little decorative cards. Or you can put them in an old glass jar for a decorative paper weight like I have done! If you are using light effects thread (the metallic one) you will need to stitch a little more slowly and carefully as it tangles quite easily. Thread your needle as far to the end as you can, and then you can move your needle down and snip the end off if it does start to tangle. For my kits, I also soak the thread in thread conditioner which makes it a little easier to work with, but if you have bought your own I recommend buying conditioner too. You can read more about stitching with light effects thread here; I love it so much that I felt it needed a whole blog post dedicated to it. Try and stitch your design in natural light if you can. This makes it much easier to see your stitches and puts less strain on your eyes. Or if (like me) you like cosy, late night stitching, sit next to a lamp or try popping a reading light on your hoop. Take the aida out of the hoop when you are not using/stitching on it to reduce the creases from the hoop. When you are ready to stitch the felt on the back, put the side with the pencil marks on against your hoop to hide them. I have a video and post about how to back your hoop with felt. If you are going to iron your finished piece, put a towel on your ironing board and put your aida right side down so you are ironing the back. This will stop your stitches going flat. Or try and iron around your stitches if you can. 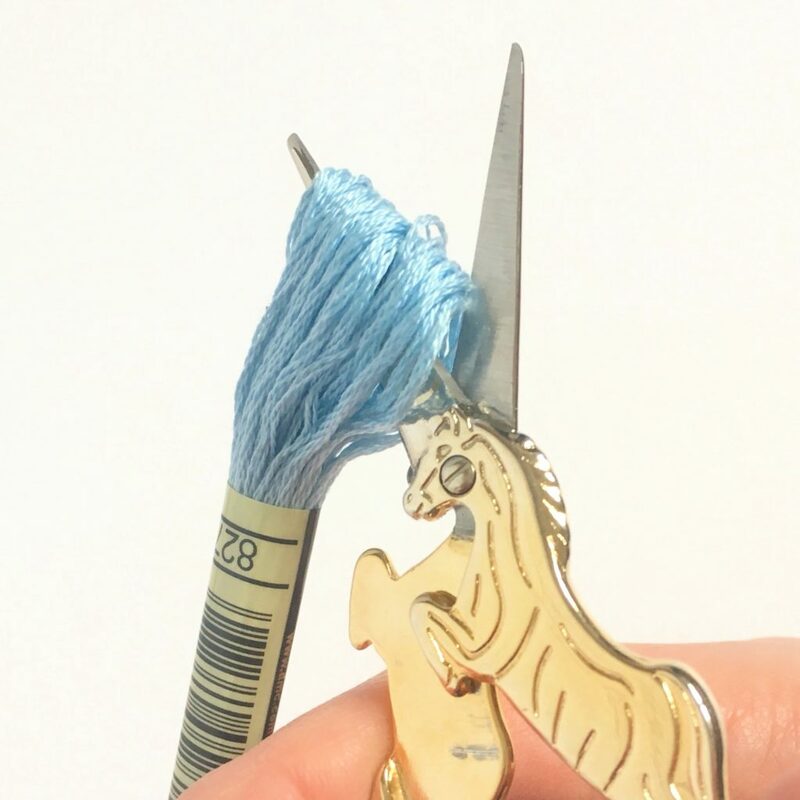 If you are prone to losing your needle, why not get a needle minder? We sell a lovely one from Koru Clay Studio (formerly Korutumi) in the shape oh a heart. They are so handy and look pretty too! 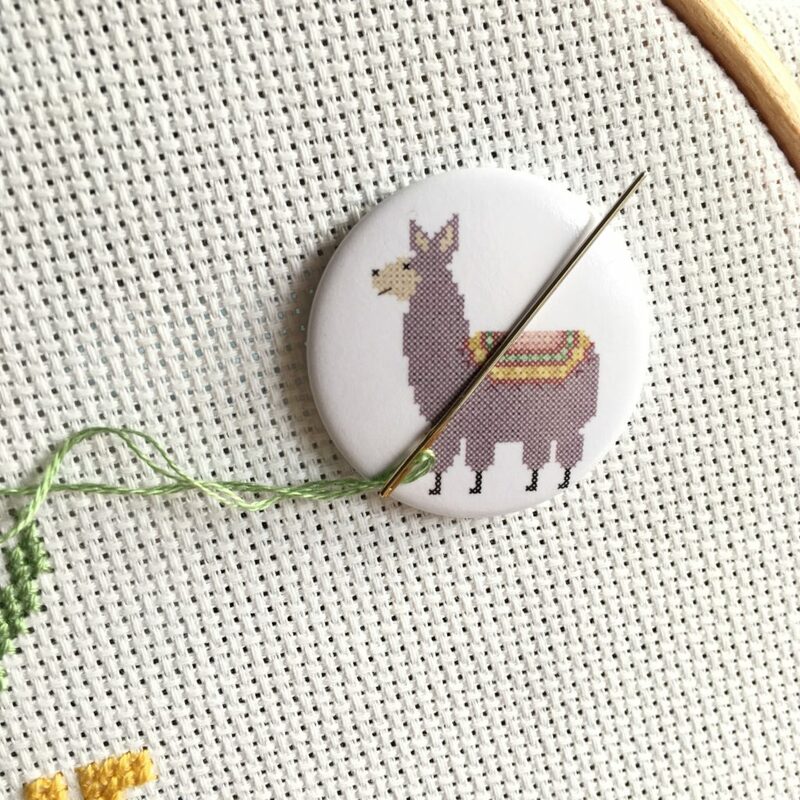 Update: These minders are currently out of stock, but you can get these cute Little Llama needle minders, which are a minder and cross stitch pattern in one! Most kits will come in a plastic bag or cardboard box (I use the latter) but if you would like something a little colourful and reusable, these drawstring bags are the perfect solution. You can even stitch on them and personalise them (which I have a tutorial for)! Wash your hands before stitching. This is a pretty simple tip, but could save you needing to wash your finished piece (unless, like me, you have kids who like to draw on your aida). Your needle will probably twist as you are stitching. Just drop it every now and then between your stitches to untwist it. Sometimes a knot may form as you are stitching too. To undo it, thread your needle back through it and it should pull out. Plan your pattern before you start stitching and make sure you have all the materials you need. There is nothing more annoying than running out of thread half way through your design. If you sign up to my newsletter, you can download some pattern planning printables to make it easier for you. Or you can buy the full, physical planner (which you can personalise)! Stitch contrasting colours of aida and thread on 16 count or higher aida. For example, I had a Halloween kit that was black aida and glow in the dark thread, which was basically white. When I stitched this hoop, I used 14 count aida and you could see lots of the black aida through the white stitches. If stitched on a higher count aida (16 count is fine) it eliminates this problem. This is because the stitches are more compact and closer together on higher counts, so less aida shows through. If you want your design smaller or bigger, stitch it on higher or lower count aida. For example, if your pattern calls for 14 count aida and it is too big for the frame you want to use, then stitching it on 16 or 18 count aida may make it small enough. 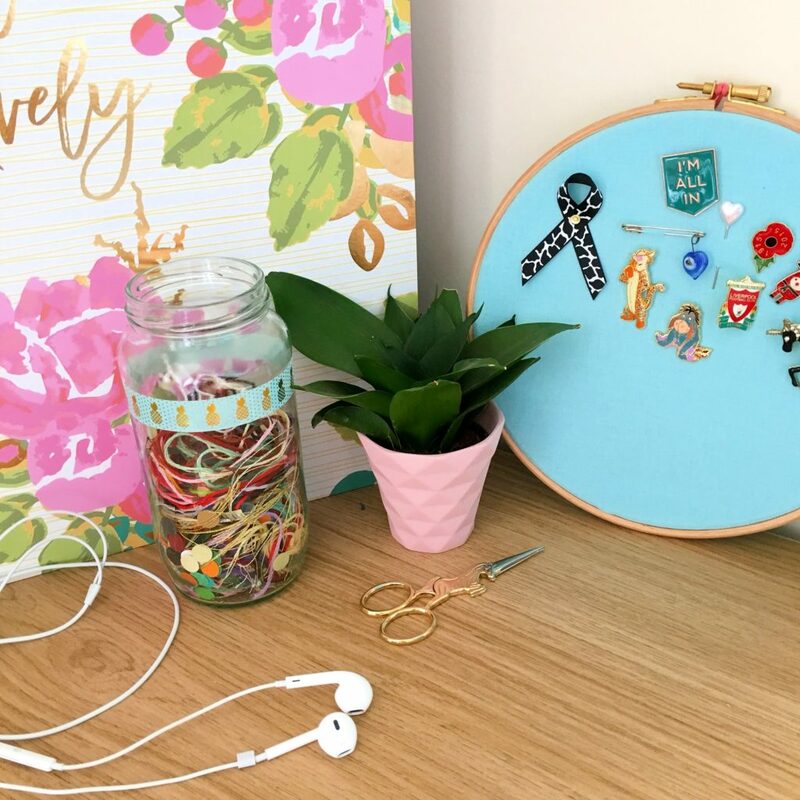 Put your feet up, relax and enjoy your cross stitch journey. Come and join my Facebook group, Hannah’s Hand Makers for more hints and tips! You can ask me any questions you might have and chat with like minded cross stitchers. And this is also where I run my regular stitch-a-longs; the next one coming up is my Hello Spring SAL 2019. 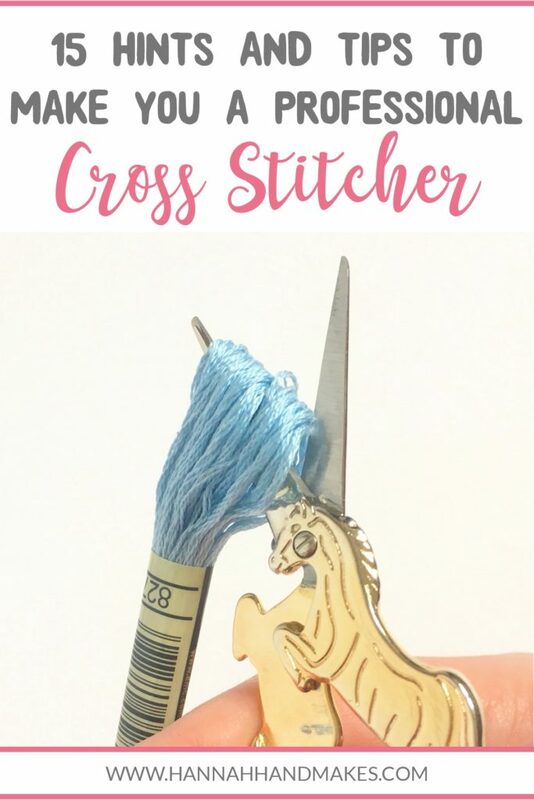 I hope these tips help you on your cross stitch journey! I would love to hear from you if you have any others to add. Just pop a comment below or email me at hannahhandmakes@gmail.com.